The tragic, scandalous story of all-American silent film heartthrob Wallace Reid, one of Hacienda Park’s first movie star residents. My latest at WEHOville.com. LIGHT TOUCH-Pianist Liberace uses a Tiki torch to symbolically light a 4-foot-high replica of his trademark candelabra, held by the rotating female statue atop the Sahara Hotel billboard on the Sunset Strip. 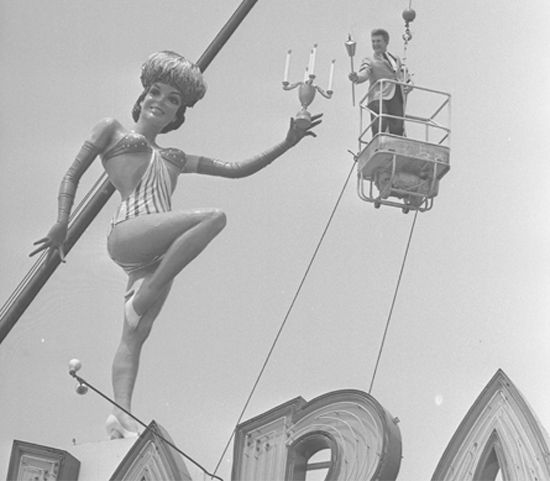 Liberace was hoisted 60 feet for the stunt, designed to publicize his new two-year, $500,000 contract with the Las Vegas hotel. 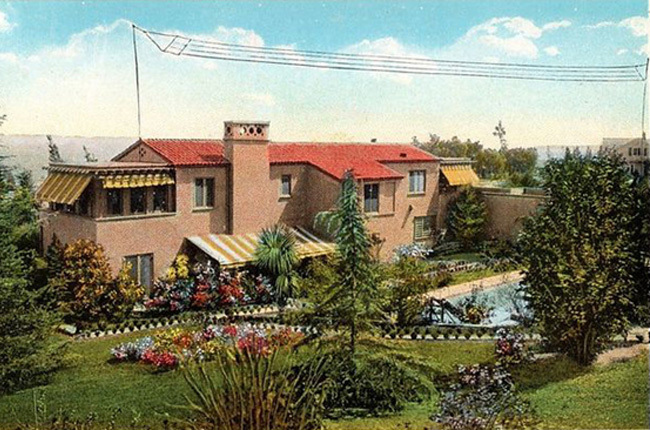 The showgirl billboard stood at the Hollywood end of the Strip, adjacent to the Chateau Marmont Hotel. Mutato Muzika at 8760 Sunset Blvd. I had a lot of fun talking about Sunset Strip history with Tracy Pattin as she was creating a walking tour of famous rock ‘n roll sites on the Strip, past and present, for Visit West Hollywood. Tracy’s tour is online now. Check it out. 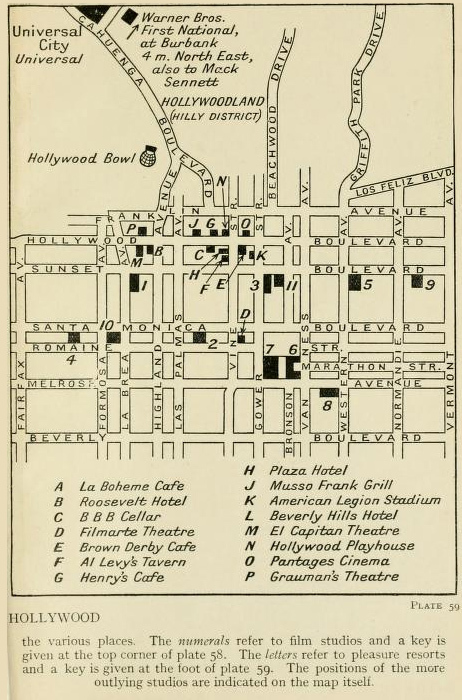 This map of Hollywood was apparently taken from a tourist guidebook. Unfortunately, the page shown here, Plate 59, is all that was available online, based on a quick but thorough scour. As the map key notes, items indicated with letters refer to “pleasure resorts.” The first of these, A. La Boheme Cafe, is not shown on this map because it was located at 8614 Sunset Blvd. [map], four miles west of Hollywood and Vine, in the Sunset Plaza section of the Sunset Strip. Cafe LaBoheme — which for a while featured entertainment by Karyl Norman, a cross-dressing star of what was known as the “Pansy Craze” — was closed during Prohibition. Later, Hollywood Reporter publisher Billy Wilkerson acquired the space and reconfigured into the Trocadero Cafe, which, in the 1930s and ’40s, was one of the most famous night clubs in the world.